Although I usually try to avoid super touristy places, I finally gave into my love of photography to recently take some remarkable photos over Melbourne. 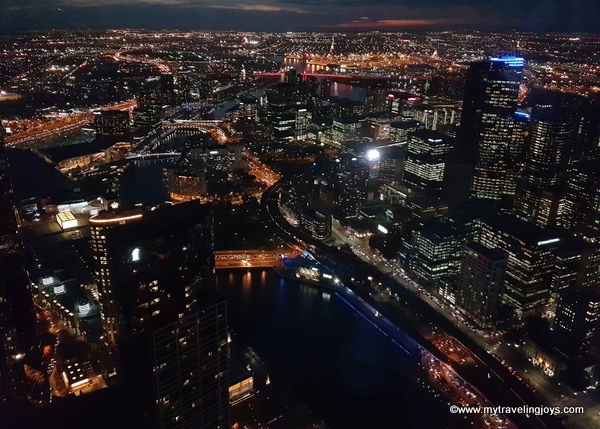 For the best city views, simply pay 20aud ($15USD) and take the fast elevator up 88 floors to the top of the Eureka Skydeck88. For months, I believed the cost wouldn’t be worth it, but I was wrong. You can’t get better views than this unless you live or work in one of the CBD’s skyscrapers or pay a few hundred dollars to take a helicopter ride over the city. Located in Southbank along the Yarra River, the building dominates the city’s skyline as Melbourne’s tallest building and stands out with its 24 carat-gold-plated glass windows on the top 10 floors. 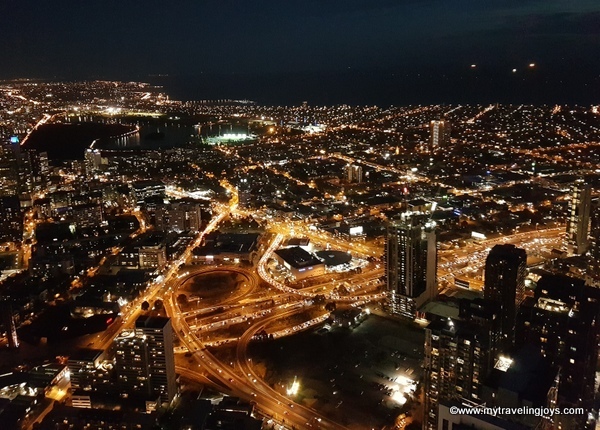 The Eureka building – named after the Eureka Stockade in the 1850s – and its Skydeck offers not only views of the city but also out across Port Phillip Bay and the Bass Strait. 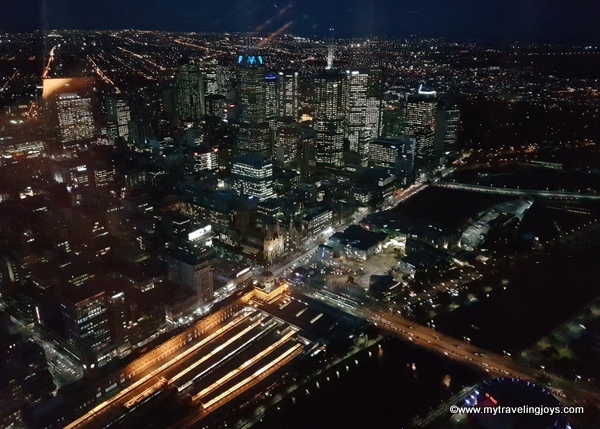 An aerial view of Melbourne’s CBD as seen from the Eureka Skydeck. I arrived shortly before sunset so I could catch the rosy and fiery orange shades light up the evening sky. 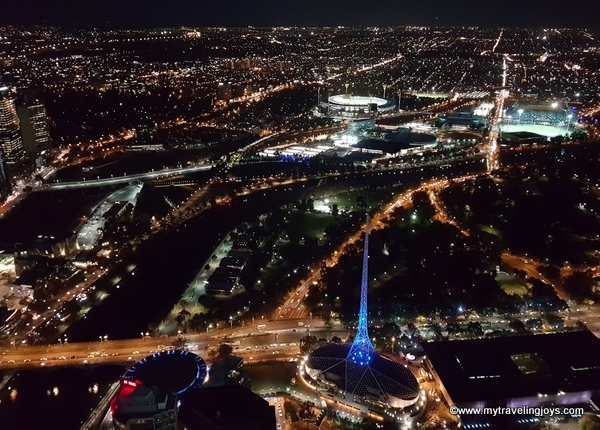 If I would go again, I would take advantage of the Skydeck’s Sun and Stars ticket option (5.50aud extra) which allows you to return twice on the same day or within two consecutive days. 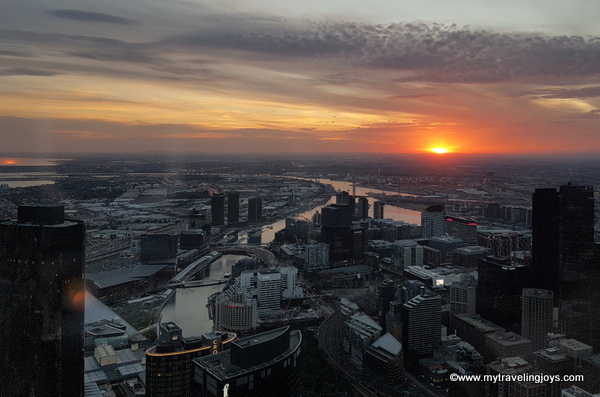 To the west, I watched the sun set over the Yarra River, the Docklands and the Crown Casino precinct. I did have to fight my way to a clear window space so I could take photos. Looking out over the CBD, you can see the historical Flinders Street Train station (bottom left) and St. Paul’s Cathedral across from Federation Square. The only problem with shooting through thick glass windows is dealing with glares and flashes from other people’s cameras. In fact, I felt like I was able to get better photos with my Samsung phone because I could set the lens right up against the windows. If you want good nighttime photos, it’s best to bring a tripod to set your camera for a longer exposure. The spire in the bottom left hand corner is on top of Melbourne’s Arts Centre, oddly kind of looking like an Eiffel Tower! Federation Square, what is considered one of the ugliest buildings in the world, is located on the left side of the Yarra. In the top right hand corner, you’ll see a stadium called the Melbourne Cricket Ground, more commonly known as the MCG, where we've watched three footy games. 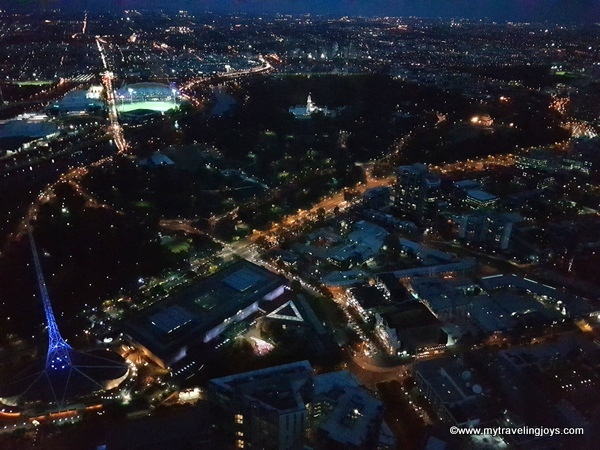 Looking out to southeast corner, here’s a view along St. Kilda Road and the Royal Botanic Gardens at night. After taking nearly 200 photos over 2 hours, I left the Eureka Skydeck feeling a bit happier. Living as an expat in Melbourne hasn’t always been easy this past year, but these stunning views reminded me how lucky we’ve been to call this place “home” – at least for a little while. Reading this and seeing the pictures makes me want to see it before we leave. Great job! 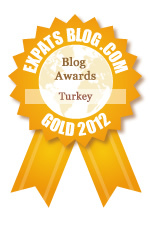 I'm still trying to visualise gold plated windows. Love the pictures. What amazing views of the city. I am glad you are enjoying the last couple of days in the city before you start your next journey. oh joy...i am feeling so bad about what has happened in your beloved city. i hope all you know are safe.